US dollars are an officially and universally accepted form of currency in Cambodia. The only time I ever saw local money was as change for things that were less than a dollar. It was a little odd getting back a handful of bills instead of a quarter. 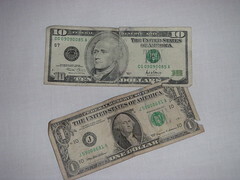 I brought two bills from the US that I couldn't spend because they were torn. Nobody would take this money. Welcome to Cambodia! Your money is no good here.